Although things were looking good for the British in America after the fall of Louisbourg and Quebec, there still remained work to be done in 1760. A large French force remained at Montreal, which continued to threaten Quebec. 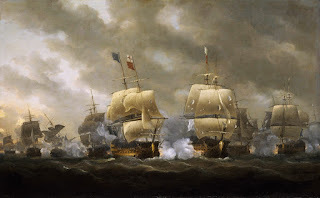 The danger of major French relief force faded after the British naval victory at Quiberon Bay late in 1759. There, the British destroyed the last major French fleet that could threaten them in the Atlantic. I have deliberately avoided describing in much detail the massive war that the major powers were fighting in Europe during this time. The war had spread worldwide, not just Europe, but also to the Caribbean, Africa and India. Clearly most of Pitt’s concern was over these other theaters of war. He wanted to threaten French colonies all over the world. America was just one of many regions in contention. But if we are ever going to get to the actual American Revolution we do not have time to focus on the many interesting battles and conflicts throughout the rest of the world at this time. Suffice it to say the British naval victory at Quiberon Bay in late 1759 essentially wiped out the French Navy. The British now dominated the Atlantic, preventing any arms, ammunition, or other supplies from reaching the increasingly isolated French forces in Canada. Gen. Jeffrey Amherst believed that one more offensive in America would push out the remaining French military still clinging to their defenses. Aside from a few western outposts, virtually all French forces massed in and around Montreal. For the 1760 fighting season, Amherst planned a three pronged attack on the remaining French forces now concentrated at Montreal. Amherst would personally lead the main force of 12,000 regulars and militia from Albany to Oswego, and down the St. Lawrence to Montreal. A second army under Gen. William Haviland would move from Crown Point along the Richelieu River toward Montreal. At the same time, Gen. Murray would send a contingent from Quebec up the St. Lawrence also converging on Montreal. All of this would require another major enlistment drive for 1760. Despite the good money, many former volunteers were reluctant to return. The British tended to hold men past their enlistments, took them further than promised to more miserable places without adequate supplies, and often reneged on promised bonuses for continued service. This had soured many. The British had held militia over the winter, beyond their enlistments, in order to rebuild the forts needed for the coming season. The militia were not happy about this and wanted to go home. Everyone else was much more reluctant to volunteer for another campaign, not knowing if they would be held longer too. To raise the necessary 14,500 militia for the campaign, colonies had to offer record high pay and bonuses. While London had reimbursed much of past costs, the colonies were still so far in debt that they felt obliged to raise the required quotas. Otherwise, London might turn off the tap and stop sending the large amounts of gold and silver on which the colonial governments now depended. In the end, the colonies met their quotas, but they were racking up record amounts of debt that someone would have to pay back at some point. With recruiting at acceptable levels, the Generals could begin their final offensive against the French in America. We last left Gen. Murray as the commander of British forces at Quebec. The more senior Generals had all died or gone home for the winter. Murray stayed with the garrison at Quebec, holding off the French forces that still hoped to retake the city. Gen. Amherst wanted Murray to lead a contingent of soldiers to Montreal where they hoped to finish off the French Army in Canada. Before Murray could play his role in the attack though, he still had to deal with the French forces outside Quebec. With Montcalm’s death at the Battle of Quebec, his second in command François-Gaston de Lévis, Duc de Lévis (whom I’ll just call Lévis) took command of the Canada’s armies. 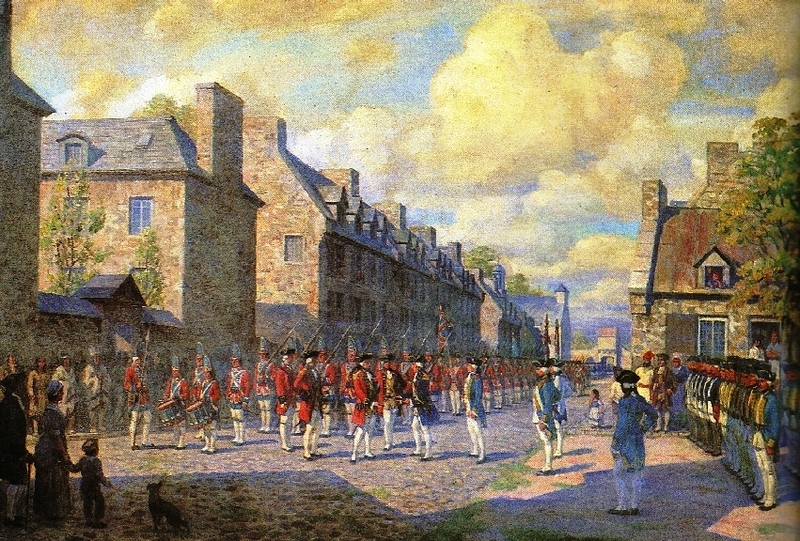 In April 1760, Lévis assembled an army of over 7000 men, mostly regulars. These were a combination of the French regulars who had fled Quebec right before it fell, as well as the relief force that arrived too late. Most militia and Indians had had enough and simply stayed home. Lévis wanted to take back Quebec before the small winter garrison of British regulars could be reinforced. He thought he could pull this off using just his regulars. Lévis scheduled his attack on Quebec for early spring for maximum advantage. It was too early for the British navy to provide relief and supplies to the winter garrison at Quebec. In an era before central heating, long winters were miserable experiences that often led to ill health, especially when there was insufficient food to get through the winter. As a result, by early spring, Murray’s 7000 British regulars were reduced to around 4000 who were ready for duty. Around 1000 had died over the winter and another 2000 were too sick to fight. As Gen. Lévis led his army toward Quebec, he encountered Gen. Murray at the small town of Sainte Foy, about six miles outside of Quebec. Murray had received word of the French movement, but was mostly in Sainte Foy to cover the retreat of his outposts before the main French Army overran them. While Murray’s army was smaller, and most of his men probably in worse health, they were all experienced regulars whom Murray trusted to fight well. The British began to fall back in good order toward the Plains of Abraham, the scene of the prior year’s battle. Lévis began to deploy soldiers in a flanking maneuver. Before they could fully deploy, Murray ordered an advance on the French position, hoping to catch the French before they formed their lines. In doing so, his men left the high ground and got caught in a bloody firefight. British cannon sank into the swampy fields and became immovable. The French counterattack was too much for the British lines. They spiked their cannons and retreated back behind the walls of Quebec. The battle, sometimes called the Second Battle of Quebec, was actually bloodier than the first. The French took over 800 casualties and the British over 1100. With the British back behind the walls of Quebec, the French began to set up for a siege. The outcome of a siege, would not be decided by the field combatants. Whichever navy could bring reinforcements first, would be able to take Quebec. But since the French navy had lost all ability to cross the Atlantic, the British navy would almost certainly arrive first. France had deployed a relief force, but the British sank most of the ships just after they left harbor. The few that made it to the Gulf of St. Lawrence found the British navy ahead of them. The remaining French ships either fled or were sunk. When the British ship HMS Vanguard sailed up the St. Lawrence on May 16, 1760, Murray knew he no longer had to worry about conserving ammunition. He renewed an all out artillery barrage against the French lines. Lévis realized the fight was over. The French scrambled back to their ships and moved back up river to Montreal where they could consolidate their forces for the final showdown. The British had secured Quebec. With supplies and reinforcements once again arriving in Quebec, Murray began organizing his offensive to take Montreal. He received orders from Amherst describing the three part invasion in which he would participate. By July, Murray was leading a force of 2200 regulars upriver toward Montreal. Before he could reach the City, Murray would have to get past a garrison of 2000 French regulars entrenched at Trois-Rivieres, or Three Rivers. The entrenchments there meant either a lengthy siege, or a bloody and risky assault on well entrenched forces. Murray decided the best option was to ignore them. He simply took his troops around Trois-Rivieres and continued on his way to Montreal. While this left enemy troops in his rear, he knew that they could only do anything if they left their defenses. Once they did that, it would be much easier to fight them on open ground. Besides, more British soldiers, another 2000 men from Louisbourg would be following behind him shortly. The French would also find themselves trapped between two armies. Murray slowly made his way upriver, demanding local inhabitants swear loyalty to Britain. The policy of treating the locals well was paying off. Most accepted their new rulers and were willing to sell the British food for the journey. The civilians seemed in no mood to rejoin militias and take up arms against the British in what clearly seemed a lost cause. If the British would let them keep their farms and property and go on with their lives in Canada, that was probably their best option. On September 1, Murray began landing his soldiers outside of Montreal. They took their time, digging in defensive entrenchments, awaiting the arrival of Amherst and Haviland with the large armies they had promised. Amherst did not begin his offensive until Aug. 10 and Haviland on Aug. 11, due to delays getting the necessary supplies. Like Murray, both Amherst and Haviland would each have to face French forces before they could reach Montreal. Amherst would have to get past Fort Lévis, commanded by the capable Capt. Pouchot, who had been forced to surrender at Fort Niagara. Pouchot had only 300 men compared to about 11,000 that Amherst commanded. His fort was on an island in the middle of the river. No British ship could pass without being attacked by French cannon. Amherst would have to stop his advance and besiege the small fort before he could continue. The result was inevitable, but the delay cost Amherst a little over a week. Next, Amherst had to face the rapids on the St. Lawrence. Although he lost only 21 men in the siege of Fort Lévis, he lost about 80 in drowning accidents on the rapids. It could have been much worse if militia and Indians had chosen to attack him there. But again, no one seemed eager to fight a lost cause. Like Murray, most locals that Amherst encountered were willing to sign oaths of allegiance and sell goods to the army. Among Amherst’s army, William Johnson commanded an Iroquois force of several hundred warriors. Although Amherst was not a fan in using Indians among his forces, the Iroquois proved valuable in encouraging local tribes to support the British, providing local guides and making the trip much easier. Amherst arrived in sight of Montreal on Sept. 5, only a few days after Murray had begun his landing. Haviland’s army of about 3500 men had to besiege a French force of about 1450 at Île aux Noix, an island at the northern tip of Lake Champlain where it met the Richelieu River. Like Amherst, Haviland would have to stop for a siege if he wanted to use the river. Haviland used his artillery to shell the small island for days. Within a week, the French pulled out and moved back to Montreal. This gave Haviland an easy river route to Montreal, although he continued to move cautiously to avoid any ambush. What slowed him up more than anything was French deserters trying to surrender, and locals coming into camp to take the oath of allegiance. Haviland arrived in Montreal within a few days of Amherst. On Sunday, Sept, 8, as the overwhelming British armies prepared to lay siege to Montreal, the French called for a truce. At first, they asked for an armistice to determine whether the war in Europe had ended. Gen. Amherst denied this obvious delaying tactic and gave them four hours to surrender. The 4000 man French army inside Montreal was in a terrible condition. Only about 2000 men were fit for duty. All the militia and Indian allies had fled the area. They were short on ammunition and supplies given the failure of France to provide any supply ships for more than a year. Facing a British combined force of over 18,000 the only question was whether to die honorably in battle, or surrender and save lives and property. Amherst made the choice easier by offering fairly generous terms of surrender. Civilians would be permitted to remain and keep their property, as long as they swore loyalty to King George. There would be no looting, massacres, or mass deportations. He refused, however, to grant the French soldiers the honors of war. They would be permitted to retain their personal possessions and return to France, but not with their arms or their colors. There were still too many hard feelings about the French massacres at British forts to offer anything more than that. 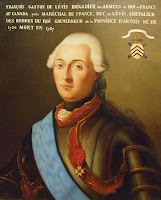 Gen. Lévis did not want to accept this dishonor and sought permission from the Governor General to remove his forces from the city and continue fighting. Gov. Vaudreuil, however, refused this and ordered him to surrender. He was not going to endanger the civilians over a point of military honor. Lévis fumed but obeyed. He did, however, have his officers burn their regimental colors rather than surrender them to the British. With the terms of surrender accepted on Sept. 9, 1760 the French military presence in Canada came to an end. Britain would control the country and its people for the next century. With the fall of Montreal, the war in Canada was essentially over. This was certainly good news for William Pitt back in London, but not a surprise, given the course of events over the prior year. 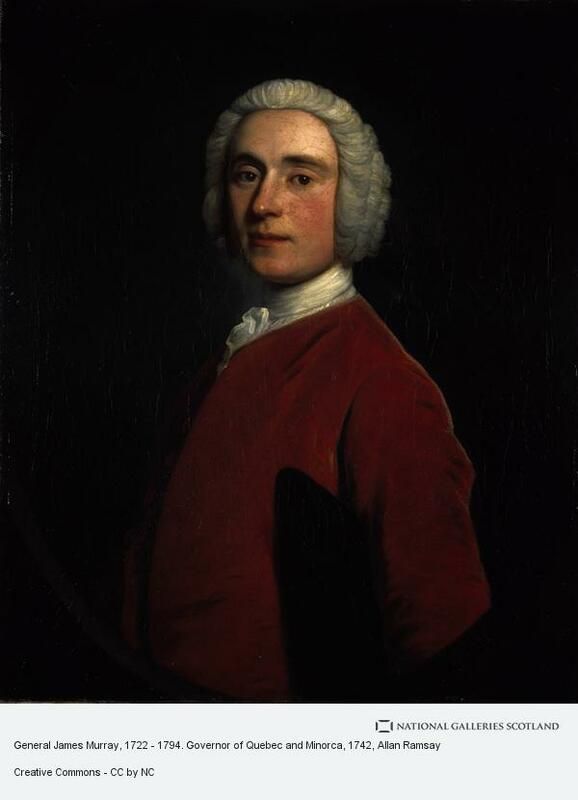 Pitt was much more focused on the war in Europe, the raids on French colonies in Africa, and the battles for India. Pitt’s successes had greatly improved his favor with the King. George II was much more inclined to trust the judgment of his most valuable minister, whom he had disliked so intensely only a few years earlier. The improved relationship, however, would not continue. On the morning of Oct. 25, 1760, the King awoke early and went to use the toilet. Shortly thereafter, servants heard a crash and rushed to the King’s assistance. The 77 year old King George II had suffered an aortic aneurysm and died within minutes. 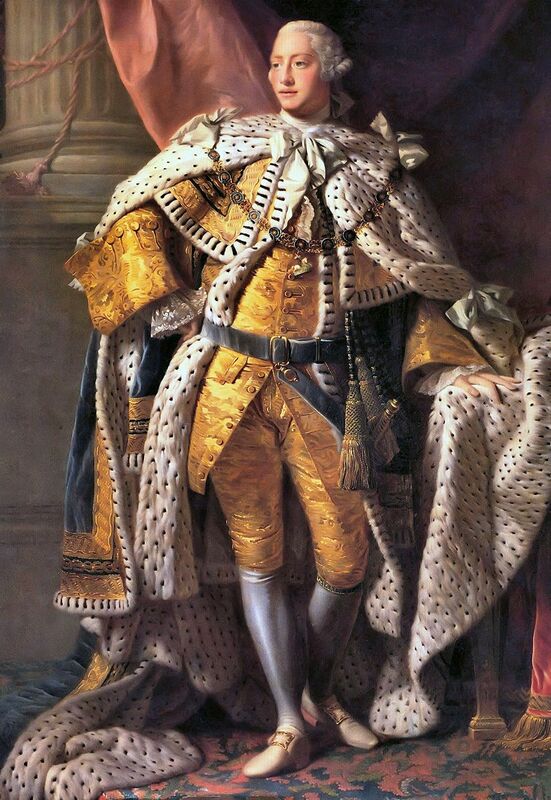 His grandson would be crowned King George III. Although the coronation would take place nearly a year later, during which time the young King needed to find a Queen, he began to assume his duties almost immediately. George III was the first British monarch in several generations to have been born and raised in Britain. Unlike the first two Georges, he did not consider himself a Hanoverian who ruled Britain. He considered himself a British King who also happened to rule Hanover. Also unlike his two predecessors, George III wanted to take a much more active role in running the government. Politicians had gotten used to a prime minister running affairs with the King providing only minimal background guidance. To have this new 22 year old leader telling them how to do things certainly caused some concern. Pitt and George III had been on friendly terms and political allies years earlier. But as Pitt had gained more favor with George II, and supported the costly European defense of Hanover and the German States, Pitt and the future King had parted ways. By the time George III took the throne, he and Pitt were political adversaries. 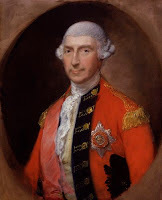 The new King had seen Pitt’s move to serve in George II’s government as a betrayal. Pitt’s success, however, made an immediate removal impossible. But the King was looking for an opportunity to dump Pitt as soon as he could. With the war in America essentially over, and with British superiority on the high seas, Pitt began pouring even more men and money into the European theater as George II had always wanted and which Britain’s allies in Prussia and the German States were demanding. The new King, however, was definitely not a fan of this policy. One of the new King’s concerns was the considerable debt that Pitt was incurring. Pitt was spending millions of pounds each year, paying for soldiers in America, Europe, and throughout the world to prop up British interests. There did not seem to be any clear strategy to repay this enormous debt. This division would only widen over time, causing problems for the government. Next week: The Cherokee rise up in America, Pitt leaves the Ministry, and Britain expands the war around the world. Montreal, 1535-1914, Vol. 1 & Vol. 2 by William H. Atherton (1914). All Canada in the Hands of the British: General Jeffery Amherst and the 1760 Campaign to Conquer New France, by Douglas Cubbison (2014). The Reign of George III, 1760-1815 (Oxford History of England), by J. Steven Watson (1960).